INTRODUCTION With Easter finally here this coming Sunday there has been a real mix of weather in many of Europe's ski regions. Along with the classic sunny spring days that see good morning conditions but slushy snow cover by the afternoon there has been a period of moderate to heavy snowfall. Some Austrian glaciers have reported up to 20cm of fresh snow in 24 hours and some ski areas in the French Pyrenees as much as 40cm in the same period. At other times the warm temperatures and a lack of wind have resulted in thick fog making visibility very difficult on the higher slopes above the treeline. This is where the snow is in its best shape this late in the season. 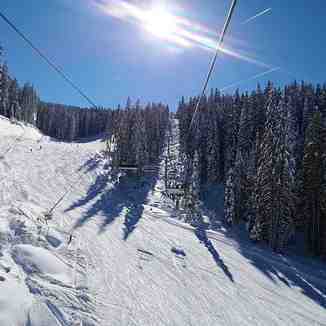 AUSTRIA Austrian ski areas have reported the biggest snowfalls of the past week. The Stubai Glacier (30/575cm), that remains open to June 10th this season, reported 105cm (3.5 ft) of fresh snow in the past week including a 50cm (20 inch) accumulation at the weekend. It's one of the few areas where it's base is actually deepening as we move further into spring and now at nearly 20 ft up top, it's looking good for (nearly) another two months of skiing. 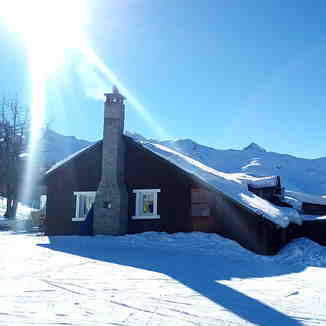 Obergurgl (85/155cm) reported 30cm of fresh snow at the same time, Solden (173/499cm): 25cm. Most of Austria's ski areas have now closed for the season but several dozen higher altitude areas remain open. 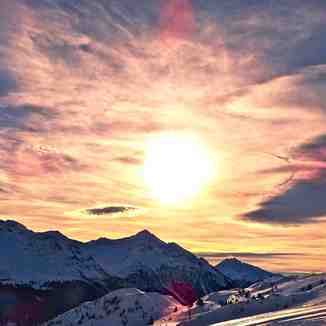 Austria has more skiable glaciers that will stay open to May, June, July and beyond than any other country. FRANCE French resorts have, arguably, had the best of the weather in the Alps over the past week. 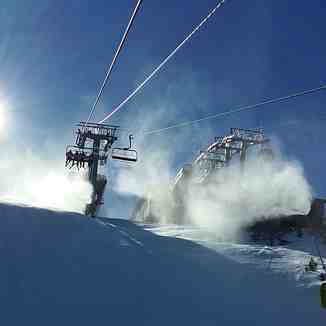 There were great sunny conditions after the fresh snow the previous week when some resorts on the eastern side of the Alps saw days of low cloud and fog. There has also been some light fresh snowfall at times, with Isola 2000 (115/165cm), in the southern Alps, posting the biggest 24-hour accumulation of recent days: a 20cm snowfall at the end of last week. A good chunk of the country's bigger areas closed last Sunday but others are staying open to Easter Sunday, next weekend, including Avoriaz (150/315cm) which has the deepest base in the country at present. A few other French areas plan to keep the lifts turning for a further week (including Les Arcs 140/290cm) or two, to the first weekend of May (such as Chamonix 0/238cm). SWITZERLAND A real mix of conditions in Switzerland this week with some great late season snowfalls bringing fresh powder to higher slopes, particularly on the eastern side of the country. However, low cloud and moisture was also in the mix. The thawing snow also brought periods of thick fog, despite the fresh powder. Conditions were frustrating, leaving some ski resorts, like Davos (79/263cm), almost unskiable as a result of severely limited visibility. Conditions on the âFrench-side' of Switzerland to the west were generally sunnier. Although, here too, there have been periods of low cloud, fog and a little fresh snow. As mentioned in the introduction, Engelberg (10/715cm), which is open for more than a month more until the end of May, continues to post the world's deepest base. But whilst the thickness of that has dropped 15cm at the top, it's down 70cm to just 10cm at the base. This reflects the current level of heat in the valley and the fact that it's increasingly difficult to ski to the base of the runs at the ski areas still open in Switzerland (and the rest of Europe). There is now a thin layer of old snow across green meadows or through forest at the bottom which is too heavy and wet to ski easily after about 11am each day! ITALY There has been some fresh snow for Italy too over the past week particularly in the Lombardy and Trentino regions. There has been nothing like the metre plus accumulations of 12-14 days ago. None the less, the Presena Glacier (300/450cm), where there's another month of skiing still to go, reported 50cm (20 inches) of snowfall at the weekend; one of the biggest falls in the world this past week. Bormio (0/210cm) got 30cm (1ft) of fresh snow at the same time. This resort plans to stay open just to the coming Easter weekend. Other Italian areas typically reported 10-20cm of snow over the past week of mixed conditions. ANDORRA Andorra received a healthy snowfall at the end of last week and into the weekend; the latest in a fortnight of light to moderate snowfalls against an overall thawing trend. There was heavier snow (up to 50cm reported) on the French side of the mountains and snow too on the Iberian peninsula. 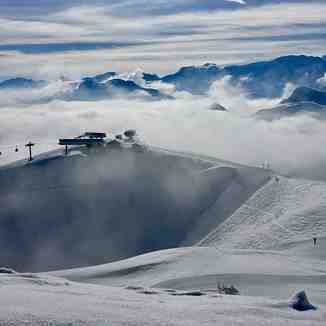 The Spanish Pyrenees had snow as did the Sierra Nevada (100/300cm). which is aiming to stay open to the start of May. 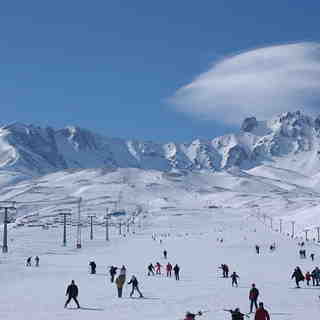 Even Portugal had snow: Serra de Estrella (20/50cm) reported that it's in great shape for Easter. Most of Andorra's ski areas will be closing after this weekend. NORWAY/SWEDEN Whilst most ski areas in the Alps may have closed or are closing for the season, most of Scandinavia's ski areas are still open thanks to their northerly latitude. Skiers and boarders are making the most of the long daylight hours whilst temperatures remain low enough for snow conditions to stay pretty good. Norway's open resorts count has actually gone up by one with the opening on the Fonna glacier (650/800cm), one of its three glacier ski areas, for summer skiing last weekend. GERMANY The vast majority of Germany's ski areas are now closed with just half a dozen aiming to stay open to Easter weekend. 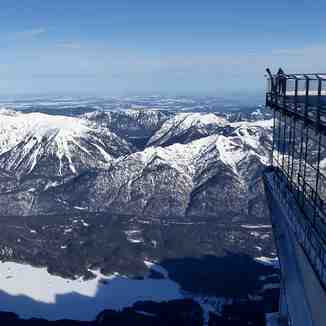 The Zugspitze Glacier (0/435cm), the country's highest ski area, continues to post the deepest base. There was 10cm (4 inches) of fresh snow here at the weekend and it will most likely be the last resort open in the country, in a week or so, as it traditionally stays open to the start of May. BULGARIA The ski season has now ended in Bulgaria and indeed most Eastern European ski areas are now closed for winter 2018/19. A handful are still operating, however. TatranskÃ¡ Lomnica (0/140cm) is one of five still going in the Slovak Republic for example. It has closed mid-week but plans to re-open for the Easter weekend; its final one of the season. In Slovenia, two areas are open: Kanin (10/230cm) and Vogel (20/75cm). Both are aiming to keep the lifts turning to May 5th. SCOTLAND The Scottish ski season appears to be definitely winding down now despite cold weather and some snow flurries at the weekend. Glencoe (20/100cm), the only area still operating with just a few runs open for good skiers only, has said that Easter Monday next week may be the last day of their 2018-19 season; not because of too little snow but because of too few skiers and boarders turning up to make it worthwhile them operating. The area usually stays open to at least the first weekend in May. Easter weekend temperatures in Scotland are currently forecast to be +8 - +18C in the valleys. JAPAN The season is winding down in Japan too, of course. Most of the country's smaller, lower areas have now closed until next winter. Some of the big names will remain open through to the first weekend in May though. Niseko (60/290cm) is one, at least it's Grand Hirafu area, but conditions haven't been great the past few days with rain and fog but no fresh snow. Gassan's famous Tsukiyama Ski Area, in northern Japan's Yamagata Prefecture, opened for its ski season at the weekend, immediately posting the world's deepest snow depth at 10 metres (33.3 feet). Normally open for 3 months to mid-July, subject to snow conditions, it was closed on Monday due to a whiteout. USA Western US ski areas have seen the biggest snowfalls reported anywhere in the world over the past week with 7-day totals as high as 135cm (4.5ft). The biggest accumulations were reported in Oregon and Utah with the most being on the Timberline (366/366cm) ski field (Oregon) where the permanent snow slope is open almost year-round. The slope here closes for a few weeks during September in good snow years. A big boost to conditions there, just before the late spring/summer ski season, is good news. 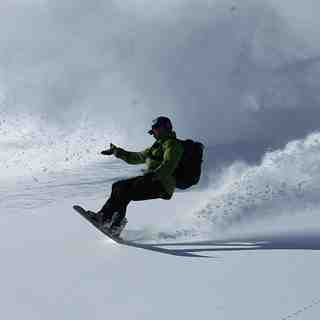 Resorts in Utah saw the second biggest snowfalls but all but a handful have now closed for the season. Alta (437/437cm) has announced it will stay open to Easter then have a bonus weekend at the end of the month with all the fresh snow there; it has had more than 1.2m (4ft) of snowfall in the past week. CANADA Most of the snowfall in Canada over the past week has been reported in the east and Quebec, although there's been rain reported here at times too. Indeed, Mont Tremblant (605/605cm) now claims to have the deepest snow in North America after some thawing of cover on the western side of the continent in California, USA, which had the deepest bases all winter up to this week. Over west, in BC, about two-thirds of ski areas are now closed with half a dozen still open but there's been up to 17cm (7 inches) of fresh snowfall reported in the last few days at resorts including Big White (208/208cm) and Revelstoke (0/240cm). EUROPEAN WEATHER OUTLOOK It looks like another week with a mixture of sunshine and cloud in the Alps. 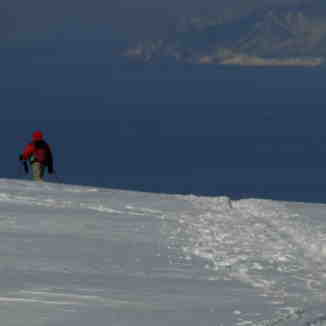 Up to 60cm (2ft) of snowfall is possible on some of Europe's highest glacier slopes. Resorts like Cervinia and Zermatt, as well as nearby Saas Fee, look like they should see the biggest accumulations in the 30-60cm bracket above 3,000 metres. Smaller falls of 10-20cm are likely on high slopes across the Alps. The Dolomites look like they're in for similar accumulations; possibly even more, in some cases, over the coming week. Unfortunately, areas like Falcade, that look like they may get as much as 60cm (2ft) of new snow, have already closed for the season. In the Pyrenees, it looks like the season could end on a snowy note at Easter with sub-zero temperatures and up to 30cm of fresh snow forecast for the weekend there. For Scotland, the week ahead (as with much of the UK) looks increasingly warm with little prospect of much, if any, fresh snow here. NORTH AMERICAN WEATHER OUTLOOK 20-40cm more snowfall is expected in the western US over the coming week with the heaviest snow in states including California and Montana. Unfortunately, a lot will fall at ski areas that have already closed. In Canada, it looks like the snow in the east that has been falling on and off through the past week will finally end with a clear week ahead. Out west there's the prospect of 20-30cm more snow for the half-dozen ski areas that will stay open beyond the Easter weekend and into next week.